Monsoon storms are here again, and that means heavy downpours, strong winds, and flash floods. It also means that your roof is in peril. The excessive winds can rip shingles and tiles right off your roof. The constant rain can puddle on your roof and seep through the roofing materials, eventually finding its way inside your home, where it can wreak havoc. Roof damage requires prompt repairs if you want to save your property and your pocketbook. It’s important to call a roofer in Scottsdale as soon as you notice a problem with your roof. Rain comes pouring down on your house, and then it comes pouring down through the roof. The middle of a thunderstorm is no time to play amateur roofer. Every second your roof remains damaged in the rain, water is getting into your home. If you make a mistake, you may not even realize it until more extensive damage shows up. You’ll have the false confidence that the problem was fixed, but rain and other elements will slowly be chipping away at your home’s structural integrity. You must call an experienced roofing contractor if you have a leak of any size. The rain will continue to beat down on Arizona for another two months or so, and you can’t afford to leave your home unprotected. A qualified roofer in Scottsdale will determine the exact source of the leak, which is not always obvious. The roofer will then repair all affected materials, including the underlayment, decking, tile, and flashing. As an amateur, you might only replace a missing shingle or tile, leaving behind damaged material that can continue to jeopardize your home. You get on YouTube to learn how to put on shingle or tile, and you think it’s easy. You just need some nails and some roofing cement, right? No. There’s a lot more to it than that. The method for replacing missing shingle or tile will depend where the roofing material is located. Missing shingle or tile might also be linked up with missing flashing, which will need replacing, as well. Finally, if any roofing material is missing, there is likely other damage on the roof, and a qualified roofing contractor needs to inspect the area to discover hidden damage or underlying problems. A monsoon can easily bring a tree or a large limb down on your roof. When that happens, it’s almost certain that you’ll end up with a hole in your roof. If a small leak can let in enough water to damage your home, you can only imagine what a gaping hole from a tree can let happen. You need that fixed properly and right away. Contact your insurance provider for a temporary emergency fix, then contact an experienced Scottsdale roofing contractor for a more permanent repair. The roofer will ensure that the substrate provides a sturdy foundation for the roof and will then repair the hole to blend seamlessly with the rest of the roof. This is something that only a highly skilled and experienced professional can pull off. Maybe you got lucky and the tree landed at just the right angle to not come crashing through your roof but just to dent it instead. Unlike the dent you would get from a fender bender, this will cause more than a cosmetic issue. The indentation indicates that the substrate has been damaged, which makes your entire roof and property vulnerable. The indentation can also allow water to pool on your roof, which will cause it to seep through eventually. The water can also weigh down that part of the roof and cause a hole to open up. A roofer needs to replace that portion of the roof entirely to ensure the strength of the rest of the roof and its longevity. Always, always call a professional roofer to make any repairs to your roof. The work may look easy, but it requires great skill to perform properly. Getting an experienced professional to work on your property will ensure that your home or business is protected, saving you money in the long run and preserving the value of your property. Make sure you call for a quality roof repair if you have any of these problems this monsoon season (or any other time of year). Allstate Roofing offers roof repairs in Arizona. We perform residential and commercial roofing work in the Valley area, including roof repair and routine roof maintenance. Whether you need to have a few tiles replaced or you need a giant hole in your roof patched, our contractors can repair your property and keep it safe. 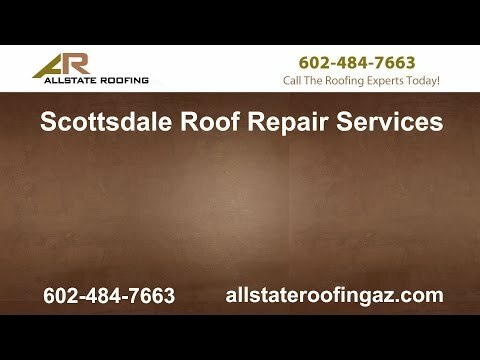 Call us in Arizona to get a free estimate for your roof repair.